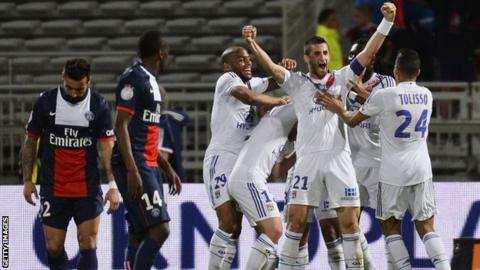 Runaway leaders Paris St-Germain suffered only their second Ligue 1 defeat of the season as Jordan Ferri earned fifth-placed Lyon victory. Midfielder Ferri found the net with a delightful 25-yard finish after a mistake by Ezequiel Lavezzi. Laurent Blanc's side created a host of chances to equalise, with Javier Pastore forcing a point-blank save from Anthony Lopes late in the game. PSG remain 10 points clear at the top of the table with five games remaining. They will secure their second successive title if second-placed Monaco lose at home to Nice on 20 April and PSG beat Evian three days later. Before those games, PSG and Lyon meet again in the French League Cup final, at the the Stade de France on 19 April. Blanc will hope to have striker Zlatan Ibrahimovic back for that game. The Sweden striker, who missed the Champions League defeat to Chelsea with a thigh injury, was again absent at Lyon's Stade de Gerland. Match ends, Lyon 1, Paris Saint Germain 0. Second Half ends, Lyon 1, Paris Saint Germain 0. Delay in match Samuel Umtiti (Lyon) because of an injury. Corner, Paris Saint Germain. Conceded by Samuel Umtiti. Attempt blocked. Edinson Cavani (Paris Saint Germain) left footed shot from the centre of the box is blocked. Assisted by Javier Pastore. Corner, Paris Saint Germain. Conceded by Anthony Lopes. Attempt saved. Javier Pastore (Paris Saint Germain) left footed shot from the left side of the box is saved in the centre of the goal. Assisted by Yohan Cabaye. Substitution, Lyon. Alexandre Lacazette replaces Nabil Fekir. Edinson Cavani (Paris Saint Germain) wins a free kick in the attacking half. Foul by Maxime Gonalons (Lyon). Jérémy Menez (Paris Saint Germain) is shown the yellow card for a bad foul. Foul by Jérémy Menez (Paris Saint Germain). Jordan Ferri (Lyon) wins a free kick in the defensive half. Substitution, Paris Saint Germain. Adrien Rabiot replaces Alex. Substitution, Paris Saint Germain. Jérémy Menez replaces Ezequiel Lavezzi. Attempt blocked. Javier Pastore (Paris Saint Germain) header from the centre of the box is blocked. Assisted by Thiago Motta with a cross. Lucas Digne (Paris Saint Germain) wins a free kick on the left wing. Attempt missed. Ezequiel Lavezzi (Paris Saint Germain) right footed shot from the centre of the box is close, but misses to the left. Assisted by Thiago Motta. Bafétimbi Gomis (Lyon) hits the bar with a header from the right side of the six yard box. Assisted by Arnold Mvuemba with a cross following a corner. Corner, Lyon. Conceded by Salvatore Sirigu. Attempt saved. Jordan Ferri (Lyon) right footed shot from outside the box is saved in the top centre of the goal. Assisted by Milan Bisevac. Substitution, Lyon. Henri Bedimo replaces Mouhamadou Dabo. Attempt missed. Jimmy Briand (Lyon) header from the centre of the box misses to the left. Assisted by Corentin Tolisso with a cross. Lucas Moura (Paris Saint Germain) wins a free kick in the attacking half. Offside, Lyon. Nabil Fekir tries a through ball, but Jimmy Briand is caught offside. Corner, Paris Saint Germain. Conceded by Maxime Gonalons. Offside, Paris Saint Germain. Lucas Digne tries a through ball, but Edinson Cavani is caught offside. Attempt saved. Lucas Digne (Paris Saint Germain) right footed shot from the left side of the box is saved in the centre of the goal. Assisted by Edinson Cavani. Corner, Lyon. Conceded by Alex. Attempt missed. Nabil Fekir (Lyon) right footed shot from the left side of the box misses to the right. Assisted by Arnold Mvuemba. Attempt saved. Yohan Cabaye (Paris Saint Germain) right footed shot from the right side of the box is saved in the bottom right corner. Assisted by Javier Pastore. Thiago Motta (Paris Saint Germain) wins a free kick in the defensive half. Substitution, Paris Saint Germain. Lucas Moura replaces Blaise Matuidi.